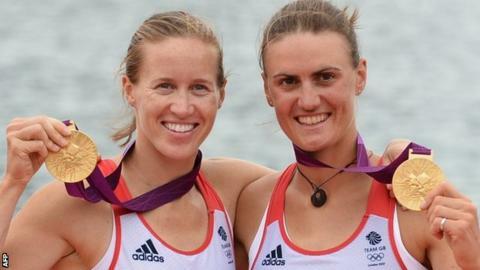 Olympic champions Heather Stanning and Helen Glover will race as a pair for the first time since London 2012 at this weekend's British rowing trials. Stanning spent a year in the army after the duo's Eton Dorney success and only returned to the squad last December. Meanwhile, Glover teamed up with Polly Swann to win world gold, but GB women's chief coach Paul Thompson has chosen to revert to the original pairing. "I'm thrilled to be rowing with Helen again. That was my aim," Stanning said. Over two days, rowers will compete against each other individually or in pairs at the team's base at Caversham in a bid to impress selectors before the squad for the European Championships in Belgrade, Serbia, is named on 14 May. Crew formations chosen for that competition will form the basis for the two World Cup regattas in Aiguebelette, France and Lucerne, Switzerland and the World Championships in Amsterdam, Netherlands in August. Following Stanning, 29, and Glover's victory in London, where they won Britain's first gold medal of the Games, the women's pair has become the women's team's lead boat. Selectors are in the fortunate position of having a current Olympic and world champion (Glover), an Olympic champion (Stanning) and a world champion (Swann) vying over two spots in that boat. Swann, 25, made her case to stay in the pair by going unbeaten through last year's World Cup regatta series with Glover, 27, before claiming world gold last September. But despite having spent just four months getting back up to speed in a boat, Stanning has impressed in training and done enough to reclaim her place alongside Glover as the battle for places in the European squad intensifies. Swann will race with Jess Eddie. Thompson told BBC Sport: "Over the winter, we gave everyone the chance to show their speed. That generated lots of data and based on that, we've chosen our pairings for the trials. "Heather has come on faster than I would have thought at the beginning and positively, there is still plenty of scope to improve. She's done very, very well. "Nothing is closed, though, and Polly and Jess have still got everything to play for." Stanning, who joined her Royal Artillery Regiment at Camp Bastion, Afghanistan for six months during her year with the army, added: "Everything is going to plan so far. Helen has progressed in the year I've been away so I'm striving to get to that standard. "Four years ago, Helen and I had just got into the squad and everything was new as we prepared for London. Now we've got that experience, but it's not just about doing what we did in the last Olympiad, we need to get better because the event has moved on." Glover said: "The GB rowing trials mark the start of our season. We don't get to race much during the year - this weekend will be one of five or six races we do - so it's something I really look forward to. "This winter, we've been training in a single and doing some work rowing in different pairs. We then spent the last two weeks on a training camp rowing in the crews we'll be competing in at Caversham. "The trials are crucial and set the tone for 2014 because if you put in a good performance, you're far more likely to be in that combination for the rest of the year. "As soon as we got back in a boat together, it all clicked back together easily - but we've also learned so much. "We took communication for granted, so we know we need to verbalise more. But sometimes you need to tear things up to get better. The main goal is Rio so we have time." Two-time Olympic silver medallist Frances Houghton, who triumphed at the winter trials in December, will go in the single and face strong competition from Vicky Thornley and Beth Rodford. In the men's events, chief coach Jurgen Grobler has split his three Olympic champions into separate pairs. Alex Gregory teams up with Mo Sbihi, Andy Triggs Hodge partners George Nash and Pete Reed will row with Will Satch. Gregory said: "Selection is always my least favourite part of the season because we're competing against team-mates but I've got a great partner in Mo and we've been going pretty well in training. It should be really competitive this weekend." In the single, defending champion Charles Cousins will face stiff competition from Olympic bronze medallist Alan Campbell, an eight-time winner of the event at trials, and Constantine Louloudis, who triumphed with Oxford's eight in the Boat Race earlier this month. Campbell said: "Charles looks very strong and he beat me in a few sessions during our last training camp, but I beat him on a few, too, so we've been exchanging blows already. I can't wait." In the lightweight singles events, Olympic champion Kat Copeland makes her return to competitive action for the first time since she won gold with Sophie Hosking in London, along with the likes of World Under-23 champions Brianna Stubbs and Ellie Piggott. Time trials and semi-finals take place on Saturday with the finals following on Easter Sunday.